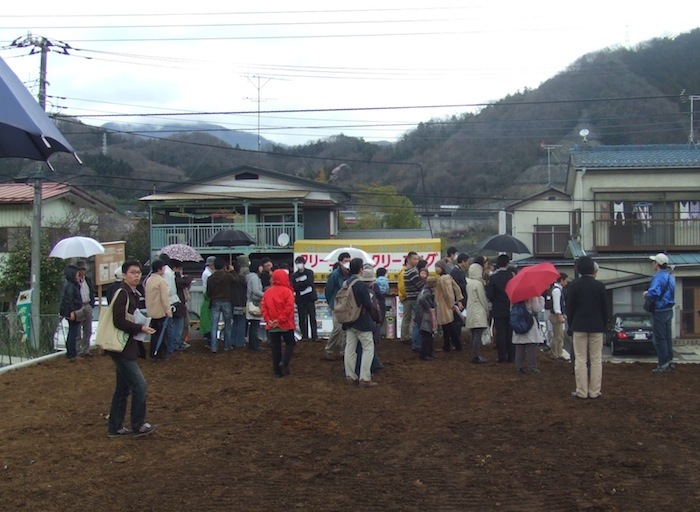 Here is this month’s Home Truths column in the Japan Times, which is about land stability, a topic we’ve discussed only in passing in this blog. It was recently reported that 32 households in the city of Urayasu, Chiba Prefecture, plan to sue Mitsui Fudosan, the company that developed their neighborhood. Urayasu, of course, suffered particularly bad liquefaction during last March’s big earthquake, since most of it is built on landfill. Some of the residents of Park City Townhouse, where homes originally went on sale in 1981, have accused Mitsui of neglect, since their homes were extensively damaged while surrounding neighborhoods, which were built by other developers, experienced much less damage. The plaintiffs are asking for ¥700 million. Many people in Urayasu have already carried out repairs on their homes, including jacking up building that sunk during the quake. The local government gave up to ¥2 million to each household that suffered damage, but for some homes that isn’t nearly enough. Jacking up a house costs at least ¥10 million. The problem with a place like Park City Townhouse is that all 70 households are supposed to act as one when making a decision, and for months the community was split between repairing and rebuilding. In order to use the large-scale repair fund (shuzenhi), which all the homeowners contribute to on a monthly basis, three-fourths of the residents have to approve. And in order to rebuild the whole neighborhood–which would require a considerable investment from everyone–four-fifths of the residents have to say yes. So far, neither of those proposals have been addressed, but almost half have decided they will file a suit “in solidarity” against Mitsui. Those residents who are not taking part in the suit, according to the weekly magazine Aera, seem to doubt that they could possibly win against such a big company. In addition, some are averse to the publicity, which will do even greater damage to their property values than the quake itself has already done. Park City Townhouse has always been something a model community. 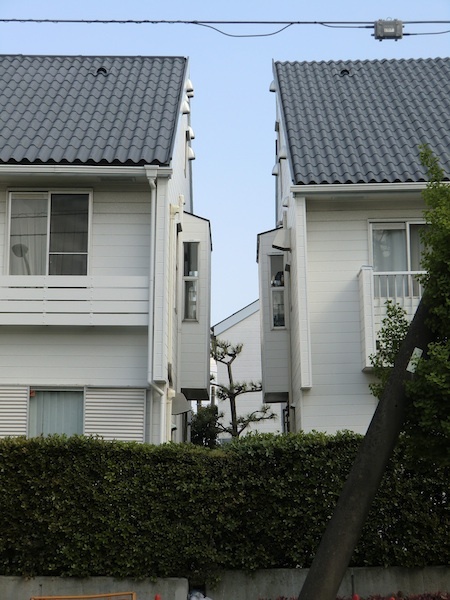 The homes, which originally cost about ¥30 million, retained their value better than most Japanese homes do, up until the quake, that is. Made up completely of two-story townhouses–a style that was popular until land values skyrocketed, thus making multi-story condos more feasible from a financial standpoint–Park City has been used as a backdrop for many movies and TV dramas when producers want to show modern lifestyles. However, the quake revealed what a shoddy job the developer did in preparing the land. Across the street, the predecessor of the semi-public housing corporation UR developed a three-story apartment complex on land that was prepared with a process called sand compaction. (Tokyo Disneyland, which isn’t far away, used the same process, which is why only the parking lot, which didn’t use it, was damaged in the quake) It suffered very little damage in the quake. In Park City, all 70 units were designated hankai (destroyed) to some extent by housing authorities. In addition, large cracks appeared in the ground from which deposits of old garbage such as discarded carpeting–i.e., landfill–come up to the surface. Geologists say that there is no real difference between Park City and the UR complex in terms of potential for ground liquefaction, so the plaintiffs are charging Mitsui with neglect when they prepared the land, and according to Aera’s research other Mitsui developments in other cities suffered liquefaction as well. Mitsui has said it feels no obligation to pay for repairs or reconstruction, citing the now familiar reason that the earthquake was “beyond what anyone could have expected” (soteigai). Aera points out that the company is very powerful in Urayasu, having helped turn it into one of Tokyo’s most thriving suburbs, and therefore the local government is anxious about taking sides. There are similar suits pending in other neighborhoods throughout the affected areas targeting different developers, but Park City seems to be the one capturing the most attention. Two weeks ago we were at the UR office in Yaesu helping some friends get around the application process and asked the employee about availability. Though there was no ulterior motive behind the question, the woman volunteered that a lot of residents in UR high-rises in the waterfront area were moving out after the earthquake. We were slightly taken aback: Only a semi-public organization like UR would admit to potential renters that people were anxious to leave their properties.